This page will inform you about the happenings in and around the school and its locality. It broadcasts only on every Saturday alternatively in English and Dzongkha class wise. Weekly news update on 9th April is brought to you by class 9 A. More details. Pantang Tshechu started on 15th April. As usual practices during a tshechu, several Cham were performed by the gelongs of Zhemgang draktshang which was headed by Lam Neten. The main objectives of conducting such Tshechu are to minimize the sins and unhealthy practices by the people. And also to preserve our tradition and culture as it includes the traditional songs and dances as well. Pangkhar Gup added saying that everything went smoothly without any problem mainly due to the cooperation from the people. He also added that the tshechu was cordially sponsored under the willing contribution of the people in and around the geog community. On the 15th of April, towards the end of last period, Yebilaptsa experienced a heavy downpour which lasted for several hours accompanied by hailstone, thunder & lightening and power failure. There were also reports stating the heavy downpour in the area of Tingtini/Tama/Goling/Tshaildang/tshanglajong and Zhurpai. The rain had caused damages in our school campus making it dirty and of all, our agricultural plots were damaged too. On Monday, 14th April, there was a screening check-up of Leprosy which was carried out by a health official, Mr. Kezang from Yebilaptsa hospital. He made visit to every classes, he checked every individual students. The check-up mainly included the observing of signs and symptoms in the areas of arms, legs, and back. Such kind of Leprosy was done not only at Yebilaptsa, but was done at Tingtibi LSS. 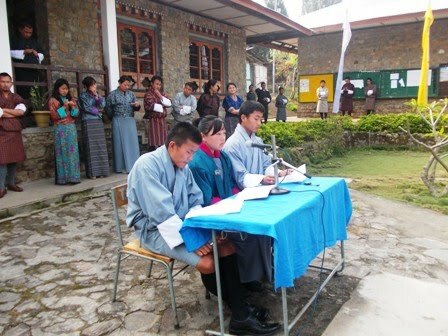 Rinchen Zangpo of class IX B shared that he was so lucky that he need not worried about the disease since he got the opportunity for chech up before-hand. The prevention of Leprosy cannot be prevented through the primary prevention. Only secondary prevention can be done by seeing the early signs of leprosy and studying them accordingly. Kharipu, a local festival which is celebrated only in the villages of Langdurbi, Digala and Kalumte. It is considered to be one of the oldest festival which is still being practiced in the present days. It is celebrated for 5 days starting from 15th of 4th month in the Bhutanese calendar annually. During the festival, a group of villager goes around the village, door to door singing, making speeches with certain tunes and praying to the local deity and the god for their blessings to the families and every individual of the community. It is done annually to preserve the age old culture which is not practiced in the any other part of the country. They also do such practices in a hope and expectation of peace and harmony in their village. This year the festival started on the 15th April and will end on 20th April. Starting from 14th April, this year, 2.5 acres of land is being cleared at a place few kilometers away from Tingtibi towards Wangdigang. The place is being cleared for the plantation of seedlings where there will be about 300 beds of different flowering plants. In each bed, they are going to plant about 1000 seedlings. Currently the works are being carried by the Dzongkhag Forestry Officers. The Dzongkhag Forestry Officers are going to develop this place into a nursery for the flower and also the centre of attraction for the tourists. And at the same time, they are also going to construct few guest houses for the tourist nearby those transplantation areas. The work is coordinated by the Mangdechu Project with an amount of Nu.4m. the work is expected to complete 4-5 years from now.